Most everyone has fantasized about winning the lottery. What would you buy? Where would you go? But for Robert Whitt, someone else’s fantasy, turned in to a bit of a nightmare. That’s why he took it upon himself to fill us in on what to do when someone’s dreams come true. 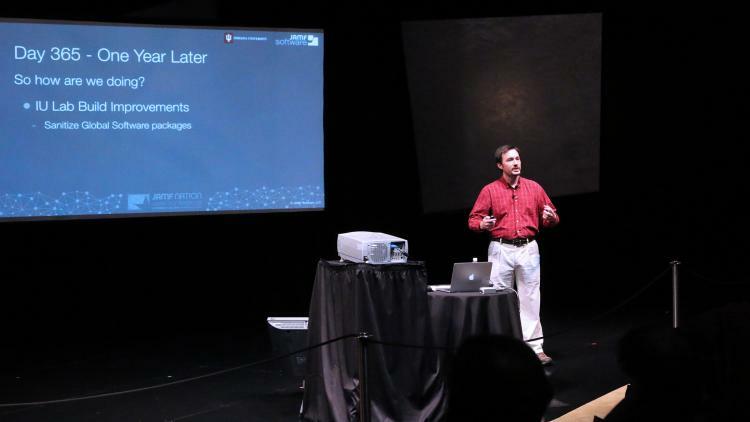 Robert, a Device Management Systems Engineer at Indiana University, discussed the challenges and successes of learning to use the Casper Suite under pressure and shared tips for preparation and recovery when someone else’s luck is your dilemma. Imagine accepting a position to be part of an IT team at a prominent university, only to find on your first day the team no longer exists and you are solely responsible for serving as the Casper Administrator. Of the three original musketeers, Casper Administrator A accepted another position elsewhere (JAMF Software), and B left for undisclosed reasons. The illusion of what the position would entail was quickly replaced as reality set in. Robert humorously recalled the trials and tribulations he went through during his first week, learning there was no team, 75 outstanding software requests, no access to passwords and the JSS, and less than 30 days until the start of classes. It was time to act — and quickly. One week and “many curse words” later, Robert was able to reset server passwords to gain access to the JSS, ensure backups were running correctly, and complete a JSS health check. The good news was the current environment was working; now it was time to establish priorities for the impending fall semester. At the end of the session, Robert reflected on the hiccups he experienced over his first year and his satisfaction with the changes that have been implemented. Professors are happy, software requests have decreased, and he’s looking forward to an (uneventful) 2015.